One of the joys of horseracing is that top-class entertainment can come in many forms, from small-field games of cat-and-mouse, to long-distance battles of attrition. 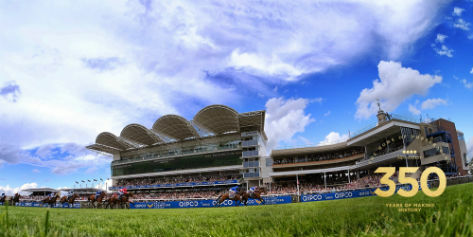 But there is really nothing quite like a big field of closely matched speedsters going Hell for leather in a Group 1 sprint, such as we witnessed in today’s Darley July Cup at Newmarket. Eighteen runners went to post, with only 10 lb between best and worst on Timeform ratings and every horse between 9/2 and 50/1 come the off. For most of the race it looked up for grabs, but one horse emerged late on to put his stamp on both the race and on the battle for Champion Sprinter status. Limato was nothing short of brilliant, and his winning margin over Suedois would have been a bit more than two lengths – clear-cut in sprinting terms as it is – had he not gone right when in front in the closing stages. In such a big field, there were a few possible hard-luck stories in behind, but absolutely no doubt about the high-class merit of Limato. He stopped the clock at 1m 09.97s – less than a second outside the course record set by Lethal Force in this race in 2013 – on a day when times were not especially quick. Blink and you might have missed it! Fortunately, TurfTrax sectionals are there to tell us exactly how Limato did it, and how those he defeated ran their races, too. They went fast from the outset, and this can be illustrated by comparing Limato’s own fractions with those of the aforementioned Lethal Force, as well as with Muhaarar, who won the race 12 months ago. Lethal Force was 0.86s quicker than Limato by the end, while Muhaarar was 0.63s quicker. Despite this, Limato was fastest after two furlongs, posting 24.81s according to TurfTrax compared to 24.96s for Lethal Force and 25.12s for Muhaarar, and that even though he was tracking the pace (set by Mongolian Saturday in 24.53s) rather than in front himself. The second furlong was the fastest of the race overall, with Mongolian Saturday running it in 10.35s (43.5 mph), the quickest individual furlong in the race in the five years for which TurfTrax sectionals exist. Every horse in this year’s field bar Arod ran sub-22.00s for the next two furlongs, and that really sorted the men out from the boys. Limato was then comfortably fastest in the penultimate furlong (11.01s), which took him into a decisive lead of 0.17s (just over a length) over the always-prominent Suedois. In sprinting terms, the final furlong was a shade slow, and not just due to its uphill nature. Limato ran it in 12.48s whereas Lethal Force had managed 12.29s and Muhaarar a swift 12.13s. But that strong early pace in this year’s contest ensured that nothing else was finishing all that strongly, either, and Limato was home and hosed some way before the line. Comparison of the TurfTrax figures for the first half and second half of the race shows that Limato ran the race near-perfectly, with a finishing speed (compared to his average race speed) of 101.8%, which is exactly the same as the course-and-distance par. Unsurprisingly, given Limato’s quality and the efficient manner in which he raced, the overall time looks out of the top drawer. As with the previous day’s Falmouth Stakes (analysed elsewhere on these pages), there were no excuses for the beaten horses in sectional terms, for all that there may have been one or two in other respects. Limato is versatile as well as talented, having won at seven furlongs on good to soft going and been a respectable fourth at a mile, in addition to this personal best at six furlongs on good to firm. Connections should have no shortage of options open to them in the future. Click here to see full sectional timing data.